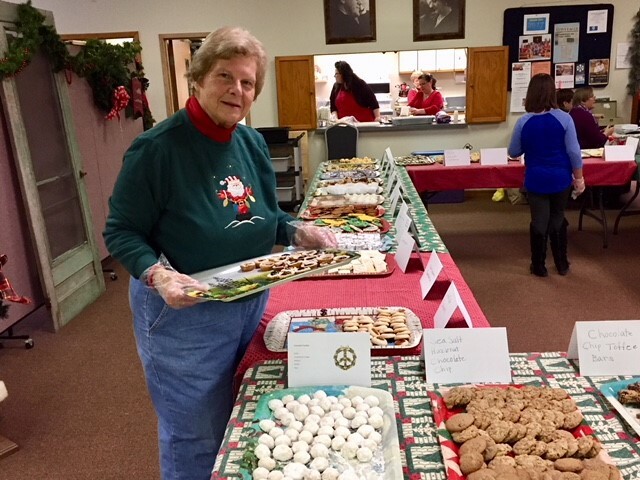 Carol Rick works on displaying some of the estimated 5,000 cookies that were available at First Presbyterian Church of Hawley, PA, in early December. 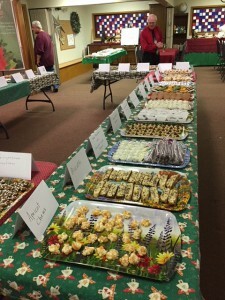 Every year for the past 16 years, a rush of people enters the fellowship hall at the First Presbyterian Church of Hawley, PA, in search of baked goodies. And there’s always plenty to choose from on this early December Saturday. In 2017 alone, an estimated 5,000 cookies were available in 33 variations of flavors, and in a matter of a few short hours they were all scooped up. 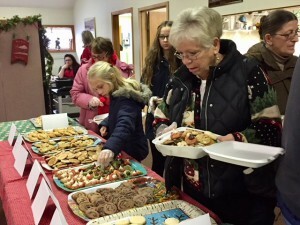 The church’s annual Cookie Walk, which is one of the prime stops for buses during Hawley’s annual Winterfest, raised in excess of $3,000 this year, with the money supporting various community events that are produced by First Church. The Cookie Walk began during year 2 of the Winterfest when a member, Carol Rick, of First Church read a magazine article about a similar fundraiser and suggested the church do the same for Winterfest. The first year $2,000 was raised, and that number has gradually increased during the years. People are given plastic gloves and a box when they enter the fellowship hall and can pick up as many cookies as they’d like. Once they are finished “shopping,” the boxes are weighed, and the customers are charged $11 per pound for the cookies, which are donated completely by church volunteers. Thirty-three varieties of cookies were available for purchase during the Cookie Walk. While the regular run-of-the-mill cookie flavors like chocolate chip, oatmeal raisin and snickerdoodles are certainly available, the congregation is well-rounded in the kinds of treats it offers, which is everything from Welsh cookies to apricot chews. “We’re known for our variety of cookies,” Bill said. 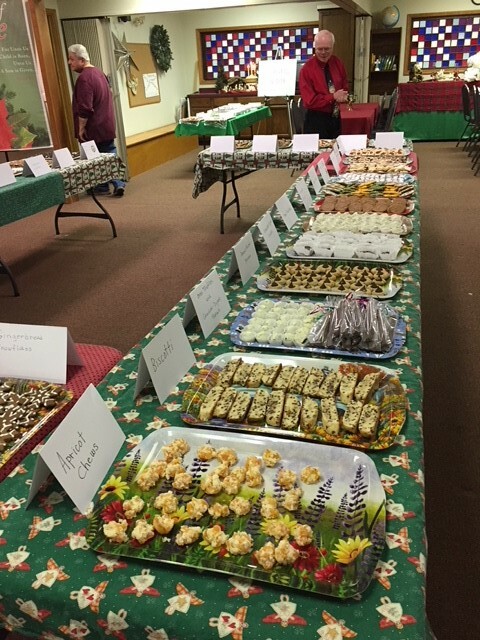 First Church also provides a Victorian Luncheon during Winterfest, where for another $11 (under 10 is $6) a person can enjoy a four-course meal that includes finger sandwiches, assorted quiche, scones with Devonshire cream and a petite dessert selection. Coffee and tea are also part of the menu, and because of the popularity of the luncheon reservations are suggested. The money raised from the Cookie Walk and Victorian Luncheon support various ministries of First Church. Among the most notable is the “Spring for Kidz” event that occurs during Memorial Day weekend. This community gathering has a carnival feel to it, as things like bouncy houses, face-painting and a petting zoo have brought over 500 people to the church’s grounds. Another outreach that benefits from the funds raised is a community luncheon that First Church participates in. First Church hosts the Good News Café on the second and fourth Saturdays, alternating with two other churches so that there is a free meal available in Hawley every Saturday. These programs have created renewed energy at First Church. The Cookie Walk is a highlight for many during Hawley’s Winterfest. An increase in membership – from 30 when Bill started in 1990 to 140 today – has enabled First Church to buy back the manse property it had sold several years ago. The church is also involved in its third addition to the building during Bill’s tenure. It also shows the worshipers at First Church that they do have a purpose in this community, and it’s one that they seem to be embracing with each passing year.